As many of you know already, I’m working on a dissertation proposal. I’m running into some interesting mental roadblocks, but also uncovering what I think are some very interesting things as I work through the process. One thought that I wanted to share was the idea of communities versus the ideas of networks. 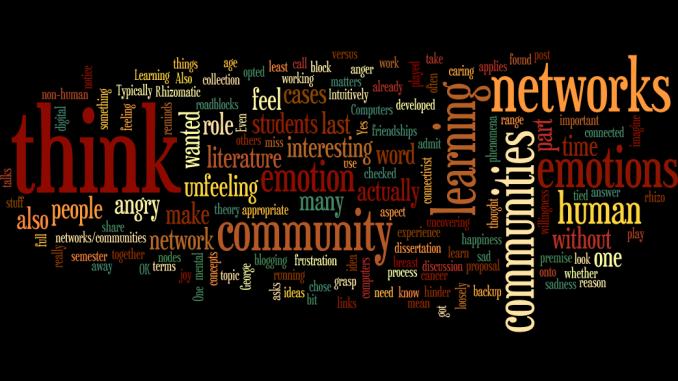 I have often opted for the word “community” over the word “network”. Even when the connectivist literature talks about “learning networks”. I do think that the theory applies to the communities that I am part of, but to call them networks is to make them unfeeling – without emotion – and I don’t think my communities are without emotion. I’ve found this in both the #rhizo (Rhizomatic Learning) community and the breast cancer blogging community. Yes, both are networks. There are people that are more connected than others. There are nodes and there are links. But in both cases, there is also caring. In many cases I have developed friendships. I notice when people are not there – I miss them. There is emotion (happiness, sadness, frustration, anger, joy … the full range). To take away the feeling aspect of the phenomena is to make it non-human. George asks “What does it mean to be human in a digital age?” I think part of being human is a willingness to admit that emotions play an important role in our networks/communities. I think that matters. Computers can think, but last time I checked computers could not feel. So, I will chose to use networks for the unfeeling stuff, and communities for the more human experience. It actually reminds me of a discussion I had with my students last semester. For some reason we got onto the topic of emotions and learning – and whether or not emotions played a role in learning. My students didn’t think so. Then I had them imagine a time when they were really angry about something – then, could they learn while they were angry? Typically the answer is no. Also, if you are very sad? Intuitively, we can grasp that there are emotions that block learning – or at least hinder it (I’ll need to look up if there is actually any literature to backup my premise on that one). OK, so this post was a bit of a collection of loosely tied together concepts but I wanted to say them. What do you think of the terms network and community? Does one of them feel more appropriate than the other? My preference is for community. I have non-emotional sources and the information coming from them sees a impoverished and neutralized without evidence of life. Not sure if our emotions block learning or not. I’m certainly less receptive to data that comes to me “un-lived” as in activities that occur within a math or a chemical formula–unprocessed through a living human is maybe what I’m trying to say.